A federal judge in Boston has allowed two illegal immigrants to get married in her courtroom so that the groom can piggyback on to his new wife’s asylum application. Chief Judge Patti Saris made the order on Wednesday which allowed Jaime Antonio Alvarez Figueroa, 29, and Tatiana Chavez Vanegas, 23, to get married. The pair are from El Salvador, have been together for several years and have a two-year-old daughter. They were living in Boston when Figueroa, a chef who has been in the US since 2005, was arrested for a DUI and driving without a license in April 2017. Upon his arrest, ICE put him in federal jail and he has remained there ever since. It has left him unable to marry Vanegas, the mother of his two-year-old daughter. On Wednesday, his lawyer Kerry Doyle asked the judge to allow him and the woman to get married, citing their hurry to become legally bound before ICE has a chance to deport him. They had a marriage license at the ready and her paralegal performed the ceremony. 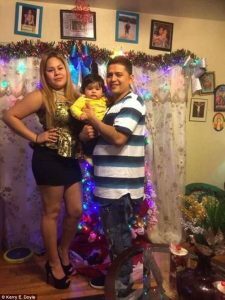 If Vanegas, who has an asylum hearing in August, wins her case, the family has a better chance of staying together. Judge Saris granted their motion and allowed a quick, minutes-long ceremony on Wednesday as the couple’s daughter watched. Because he is a federal inmate, he was not allowed to kiss or even touch his new bride. The judge’s clerks, overcome by the happy moment, clapped after the ceremony was complete. Speaking to DailyMail.com on Thursday, Kerry Doyle, the man’s lawyer, said it was an ‘unusual’ situation but that she was pleased with the outcome. ‘It was quick and they were not allowed to touch. Because he is in ICE detention, they had to stand on other sides of the table.